Take a "leave nothing to chance" approach to building a data analytics service line. Are you tapping into the power of the data at your fingertips? By strategically assessing the right data and leveraging technology, you can provide better attest services and enhance your advisory service offerings for clients. It’s easy to get overwhelmed by the volume and variety of data available. And it seems each year there’s more and more information to process. So how do you track and analyze the right numbers without getting bogged down in the weeds? Launching Data Analytics will help you build a data analytics service line for both internal and client use with a comprehensive step-by-step process for success. The June 19-21, 2019 BootCamp in Chicago is full! We have opened a new session October 14-16 in Atlanta, Georgia. Who should attend? The objective of this BootCamp is for you to launch a successful data analytics service line. To accomplish this, it takes more than one person. It is important you have a team of individuals working together toward this goal, your Launch Team. 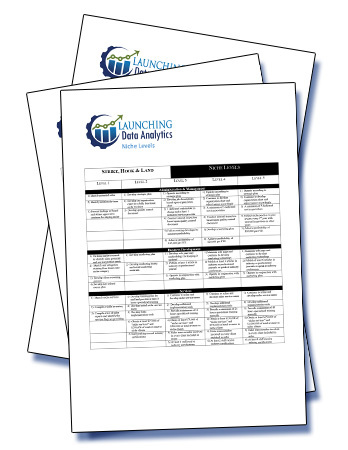 The size of the Launch Team is up to you, and the BootCamp is designed for that team. What can you expect? Jeremy will use a combination of presentation, customized planning tools and peer-to-peer sharing to provide a step-by-step guide to creating a successful and profitable data analytics service line. What is the cost? The registration fee is $3,700 for two BootCamp attendees, with additional attendees at $1,100 each. UAN members receive a $200 discount on each participant. When you register for the program, you’ll gain access to an online tutorial to walk you through the basics of data analytics, the resources needed to launch a data analytics program and how to complete the BootCamp Preparation Workbook. The objective of the online tutorial is to provide you the foundation you need to prepare for the on-site BootCamp. What analytics should you offer? What differentiates analytics for advisory services from analytics within attest? How do you define analytics for your firm? 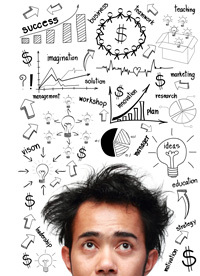 How can you identify the need in your client base? How do you find existing expertise? How do you determine goals for the service line? What’s the time frame for building and launching the service line? During this session, Jeremy will also introduce a method for defining levels to use for measuring success as the service line matures. Before firm members attend the 2.5 day workshop, we’ll lay the groundwork for success. 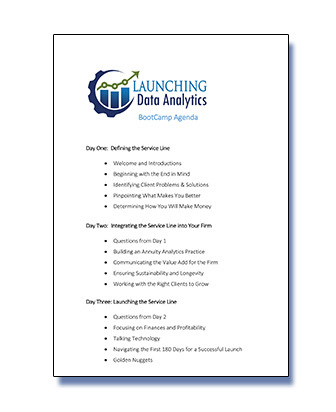 The Launch Team will work through the BootCamp Preparation to ensure they arrive ready to work and can leave the workshop with a complete plan to launch a successful data analytics service line. 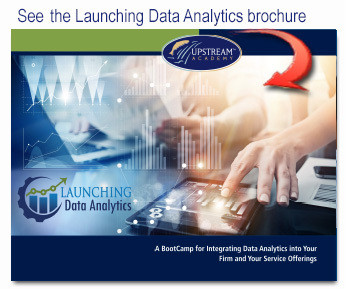 Those selected for your firm’s Launch Team will meet for a 2.5 day Data Analytics BootCamp. This session will be highly interactive and allow teams to discuss key concepts necessary to launch a data analytics service line. Topics will include the challenges in starting a new service line, strategies to overcome these challenges, technology considerations, personnel training, marketing the service both inside and outside the firm, sustainability, and profitability. Attendees will leave the BootCamp with a plan and the tools they need to launch a successful and profitable data analytics service line. Thought leader for our profession, Jeremy Clopton, has years of experience navigating the challenges of starting and running a successful niche. Jeremy Clopton gained his real world experience from his work with one of the top accounting and consulting firms in the country, where he led the firm-wide Big Data & Analytics practice. 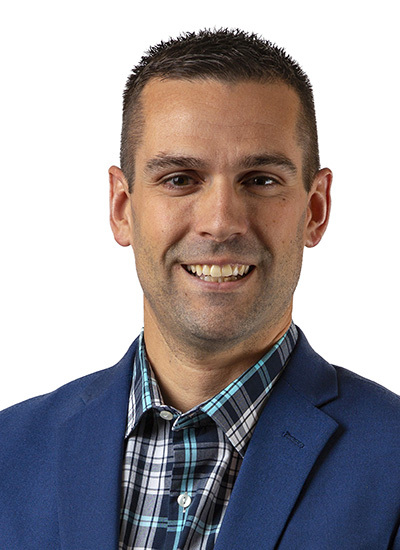 During his 12 years there, Jeremy gained extensive experience in data analytics, fraud prevention, and business intelligence, but his real passion was going beyond providing the services clients asked for – to help them determine what they needed for future success. Jeremy believes in the potential of data and technology to transform firm practice management, leadership, and firm culture. A dynamic and insightful presenter, Jeremy speaks both in the US and abroad at industry events, as a faculty member for the ACFE and as an instructor at the Management Development Institute at Missouri State University. His dedication to not just meeting, but exceeding, client expectations makes him a favorite for participants. Upstream Academy is registered with the National Association of State Boards of Accountancy (NASBA) as a sponsor of continuing professional education on the National Registry of CPE Sponsors. State boards of accountancy have final authority on the acceptance of individual courses for CPE credit. Complaints regarding registered sponsors may be submitted to the National Registry of CPE Sponsors through its website: www.nasbaregistry.org. We’re confident that Launching Data Analytics will be of immeasurable value to you. 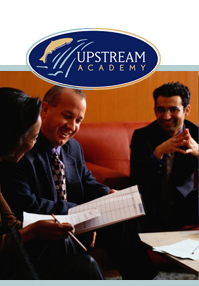 Like everything we do at Upstream Academy, this program is unconditionally guaranteed to your full satisfaction. If you’re not completely satisfied, we will, at your option, either waive your fee or accept that portion of the fee that reflects your level of satisfaction.